I just re-uped my MotoVlog game since getting this bike. 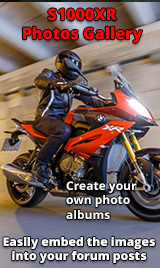 Subscribe if you are interested in the finest roads in the USA on the finest bike on the road, the BMW S1000XR! Can you please relocate your camera to a higher vantage or ditch the smoked screen? I feel like the view my eye wants to see most is censored by a black square.